Anthony Amoroso (Part 1 of 3) EDITORS NOTE: ANTHONY AMOROSO IS NOW EXECUTIVE CHEF OF SEABLUE, BORGATA IN ATLANTIC CITY. 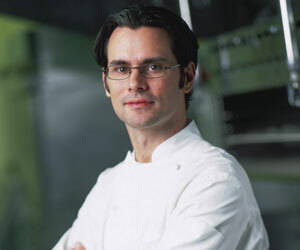 MARC ST. JACQUES IS NOW THE EXECUTIVE CHEF OF MICHAEL MINA AT THE BELLAGIO. Anthony Amoroso, Executive Chef of Michael Mina at the Bellagio, has been in Las Vegas for a little over four years-and he loves it. The city has a special vibe, he says, and is the perfect place to prepare amazing food. "Everyone who comes here, if they want to, can feel like the big fish," Chef Amoroso insists. "You can go as big as you want to go here. All is here and all is accessible and it's not necessarily that way where you're from. I think that's what makes the town special." TravelsinTaste.com recently had the opportunity to chat with Chef Amoroso about his love for Sin City, including recent changes in the Las Vegas dining scene, Michael Mina's unique offerings and the things that dedicated customers will do for a chance to eat in his dining room. First, though, we asked Chef Amoroso what he likes most about Vegas. His answer? Its wide-open entertainment landscape. "The access is amazing," he says. "Every major club, restaurant and show is here. You can come and not have to plan it out or know someone. If you know you're coming, you can get into the show, restaurant, club or spa you want to go to. You don't have to be on a long waiting list or inherit the access from a family member. There is total access and people can go massively big if they want to go big, or they can have a little relaxation. It's quite brilliant, actually." During the past several years, Chef Amoroso has noticed tremendous changes in Vegas. Many noted chefs have arrived, for instance, which makes for a more competitive local dining scene. "These days, people only come once," he says. "With so many choices, you have to be sure that when you get them, you make a really good impact so that you get them again." There aren’t just more top chefs in Vegas these days, though. There is also more top product. "In New York I can get two deliveries a day, and I can get whatever I want as far as product goes. That wasn’t the case here even four years ago." Product is much more accessible in modern Vegas, thanks to suppliers in Los Angeles and San Francisco who shop local farmers’ markets and ship ingredients east to Vegas. "I can offer heirloom product that I couldn’t get four years ago-same with fish and meats and others," Chef Amoroso says. The cost for shipping is high, he adds, but the quality of ingredients is well worth the price.